Mount Hood National Forest (MHNF) recently completed a $1.7 million overhaul of its Zigzag Ranger Station, the de-facto visitor gateway to Mount Hood. Yet the historic Upper Sandy Guard Station, a National Historic Landmark located just a few miles away, near popular Ramona Falls, has fallen into a serious state of disrepair. Basic repairs needed to save the historic guard station would cost a fraction of what the Zigzag project cost, so why has the Upper Sandy structure been so badly neglected? Part two of this article looks at some of the reasons behind this frustrating paradox, and some possible solutions. The Upper Sandy Guard Station was built along the newly constructed Timberline Trail in the 1930s. Its purpose was to house a Forest Service guard, stationed there to patrol the Bull Run Reserve — Portland’s water supply — where it abutted the new around-the-mountain recreation trail. 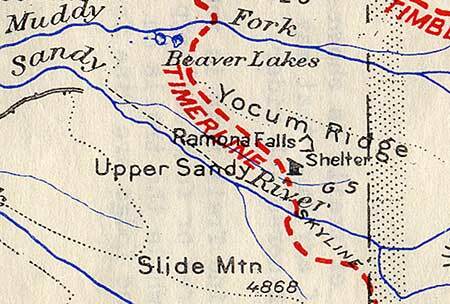 At the time, the Bull Run boundary was much more expansive, touching the northwest corner of Mount Hood. 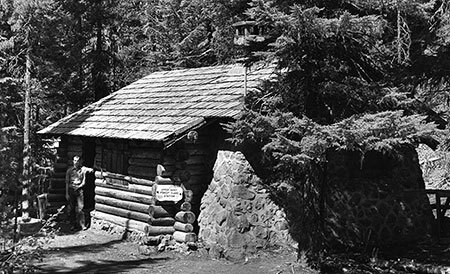 The Upper Sandy Guard Station was one of dozens dotting the Mount Hood National Forest in the 1930s, all built to protect forest resources from timber poaching and other illegal activities. Several of the old guard stations could only be reached by trail, and the roads that did reach them were primitive. The guard stations also served as a supply and communications base for the scores of fire lookouts built throughout the forest, often connected by phone lines that can still be found along less-traveled trails today. As recreation use along forest trails grew in the 1920s and 30s, guard stations also provided a comforting presence for hikers exploring the largely undeveloped national forests of the time. 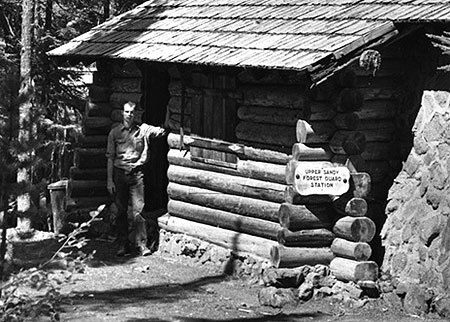 The industrial logging era that began in the national forests by the late 1940s soon made guard stations obsolete: as thousands of miles of logging roads were bulldozed into remote areas once only accessible by trail, forest administrative operations were consolidated into a few ranger district office, and most of the old guard stations were shuttered. The unused buildings soon fell into disrepair, and most of these structures were dismantled or burned by the Forest Service in the late 1950s and 1960s (along with most fire lookouts, also deemed obsolete as aerial fire surveillance began). When the Bull Run Division boundary was changed in 1977, the Upper Sandy Guard Station was left miles away from the resource it was built to defend. One year later, the Mount Hood Wilderness was expanded to encompass the building, sealing its fate as a relic in the eyes of the Forest Service. The few guard stations that did survive decades of neglect intact now represent a precious glimpse into an earlier, idyllic time in the national forests. They now stand as historical gems, worthy of special protection. Some of these structures have already been preserved, like the Clackamas Lake Guard Station near Timothy Lake, while others have been allowed to fade away nearly to oblivion, like the Upper Sandy Guard Station. A few that survived intentional destruction by the Forest Service have nonetheless been lost to neglect, like the former High Prairie Guard Station on Lookout Mountain, a building that was partially standing as recently as the early 1980s. In September 2009, the National Park Service finally added the Upper Sandy Guard Station to the U.S. National Register of Historic Places, a move that many considered to be the building’s salvation. After all, the Forest Service had actively sought the historic designation and local Forest Service historians had strongly advocated for preservation of the building. Thus, the disappointment in the years since, as even the most rudimentary Forest Service efforts to stabilize the building failed to materialize. 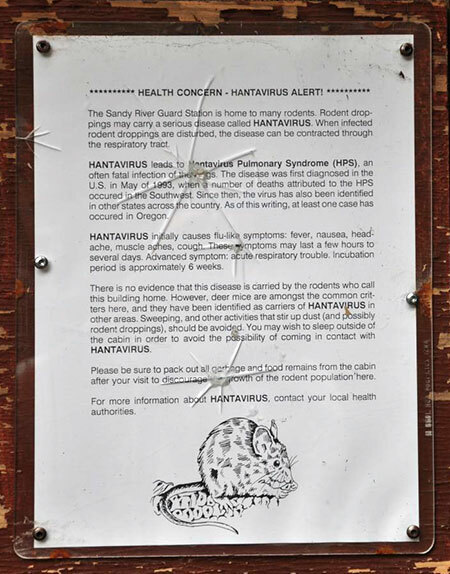 Of course, deer mice surely inhabit every other historic wilderness structure in the wilderness areas around Mount Hood, yet no health warnings are posted on the shelters at McNeil Point, Cairn Basin, Cooper Spur and Elk Meadows or the lookout at Devils Peak, where hikers routinely camp inside (and maintain) the structures. So, the point of this notice on the Upper Sandy structure seems to be to frighten visitors from entering — or perhaps maintaining — the structure. 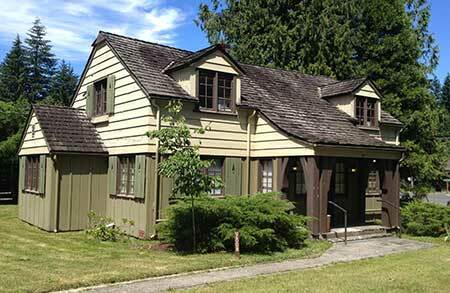 The Upper Sandy Guard Station was added to the elite National Register partly because of its historic role as a base for patrolling the Bull Run Reserve, but mostly as the only surviving design of its kind in the Pacific Northwest. The building has a unique, rustic architecture that embodies the New Deal programs that put skilled craftsmen and laborers to work on our public lands as part of the 1930s economic recovery. Most notable is the massive stone masonry end wall that has probably helped stabilize the structure as the log walls continue to deteriorate. Its unique design combining rubble stone and wood walls make it one of a kind among the more than 700 forest administrative buildings constructed during the New Deal era. The building was constructed by a seven-man crew in the summer of 1935 with a budget of $958.88, including materials: two carpenters worked at the rate of $7/day and two laborers assisted at the more modest rate of $4/day. 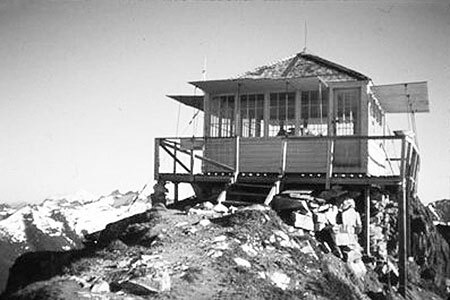 The guard station was completed on September 28, 1935. Today the building suffers serious holes roof and will almost certainly be lost in a few years without an immediate effort to stabilize the structure, or better yet, all of the work needed to fully restore this building. So, why is the Forest Service allowing this to happen? Blame it on the Wilderness..? 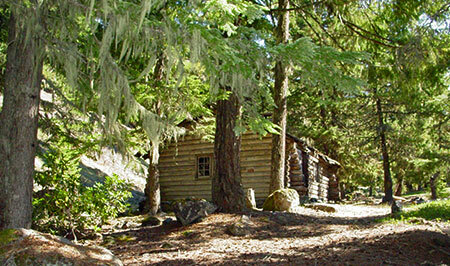 For a time following the 2009 National Historic Register listing, the old guard station had an advocate in the Northwest Forest Conservancy (NFC), a local non-profit focused on preserving several historic forest structures in the Mount Hood National Forest. Today, the NFC appears to be inactive, and there are no advocates pressing for the building to be rescued. Prior to the 2009 Historic Register listing, the NFC formally proposed managing a restored building. Today, several historic structures in the Tilly Jane area (on the northeast side of Mount Hood) are managed in this way by the Oregon Nordic Club under an agreement with the Forest Service. Under such an arrangement, the Upper Sandy Guard Station could have been put it to year-round use as part of its restoration. The NFC envisioned volunteers to staff the guard station during the summer, as the proximity to both the trailhead and nearby Ramona Falls makes the guard station a natural base for both volunteers and visitors. Sadly, this plan never moved forward. Despite the agency effort to list the building on the National Register, friends of the old guard station within the Forest Service are surprisingly scarce, and mostly limited to historic resource specialists whose workloads spans multiple forests. 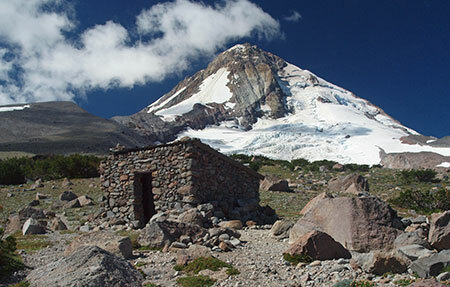 Unfortunately, the Upper Sandy Guard Station carries a still heavier burden than simply a lack of interest from the Forest Service: since a 1978 expansion, the guard station has located within the Mount Hood Wilderness, which by some interpretations means it should be allowed to fade into the oblivion in deference to protecting the untrammeled nature of wilderness. Is it really that simple? Not at all, but internal Forest Service e-mails on the fate of the historic structure show Mount Hood National Forest recreation planners quickly turning to this argument in defending the decision to let the Upper Sandy Guard Station fall further into disrepair. The same e-mail exchanges also reveal internal rivalries between recreation and historic resource staff that have more to do with protecting recreation budgets than adhering to strict interpretations of the Wilderness Act. Letting this historic building deteriorate is also at odds with the 1999 Mount Hood National Forest facilities master plan, a forest-wide effort to address surplus Forest Service building. The facilities master plan identified the Upper Sandy Guard Station as surplus building, but set no policy for decommissioning or disposing of the structure — one of the core purposes of the facilities plan. The 1999 facilities plan includes other historic structures located inside wilderness area, notably the lookouts at Bull of the Woods and nearby Devils Peak. Both lookouts are included in the National Historic Lookout Register, which is often a first step toward listing in the more rigorous National Historic Landmark Register. 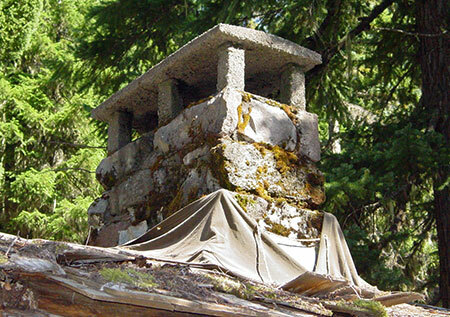 While the Forest Service is silent on Bull of the Woods lookout (and the structure is now showing signs of serious disrepair) the Devils Peak Lookout is described on the Mount Hood National Forest website “open to the public” and maintained as a Forest Service facility. Why the disparity, especially given that the Devils Peak lookout lacks National Historic Register status? 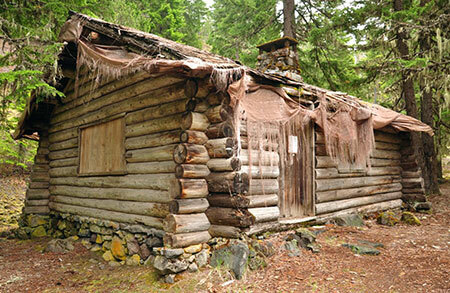 For now, that remains a mystery, as the Forest Service does not seem to have a comprehensive plan for their historic wilderness structures, nor a consistent policy on which structures will be allowed to deteriorate beyond the point of repair — including the remaining Timberline Trail shelters and other facilities across the forest that have gradually been incorporated into new wilderness areas over the years. This massive new bridge over modest Ramona Creek was built in 2012 inside the Mount Hood Wilderness, less than a mile from the Upper Sandy Guard Station. Still more confounding is the fact that the Forest Service constructed an elaborate new bridge over Ramona Creek in 2012, just a mile from the Upper Sandy Guard Station and well within the Mount Hood Wilderness. Ramona Creek is a modest stream that can be easily crossed without a bridge, so how was this structure justified? In a reportedly confrontational exchange in 2007 over the Upper Sandy Guard Station several years ago, a recreation planner from the Zigzag Ranger District responded to questions about the structure with “Have you READ the Wilderness Act? Man-made structures are NOT allowed!” Yet, the same planner was apparently responsible for construction of the elaborate new wilderness bridge over Ramona Creek in 2012. 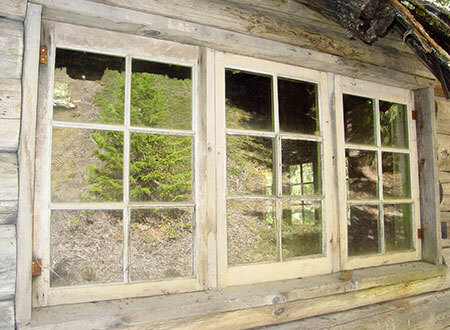 Clearly, the Mount Hood National Forest has no consistent policy on structures in wilderness areas, historic or otherwise, and thus the highly selective, subjective decisions by district-level staff to build new structures while allowing historic structures to deteriorate. So, what to do? Fortunately, the answer seems to be coming from the federal land agencies, themselves. 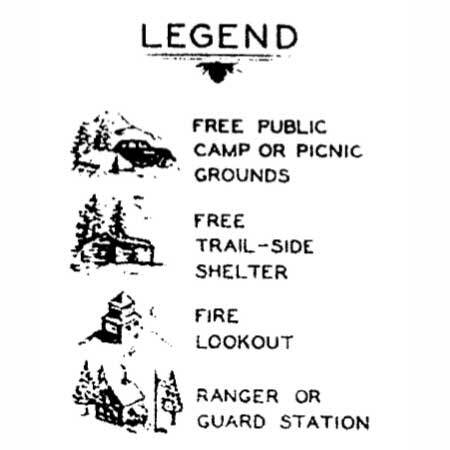 Core to the Mount Hood National Forest rationale for letting the Upper Sandy Guard Station fade into oblivion is the opinion — albeit, selectively applied — that “man made structures are not allowed” in wilderness areas. This opinion stems from a series of three recent court decisions and is now widely shared as gospel among the federal land rank-and-file staff. Therefore, if historic structures represent a “feature of value”, then preserving the structure would be the “minimum requirement” for administering the resource. That’s a lot of legal wrangling, but it could just be what saves our historic wilderness structures. The Upper Sandy Guard Station sits on a flat bench above the Sandy River, just off the modern alignment of the Pacific Crest Trail. Taking this interpretation a step further, the fact that “scientific, educational (and) scenic” values are also listed suggests that preserving the Upper Sandy Guard Station by virtue of using it as an overnight rental facility or even staffing it to provide an administrative presence along the overwhelmingly popular Ramona Falls Trail would also be “values” that pass muster under the Wilderness Act. So far, this new approach has not been tested in the courts, but it does offer a hopeful alternative to the troubling direction of recent decisions. In the meantime, historic resource advocates in the State of Washington recently short-circuited these recent court decisions in a successful effort to save the Green Mountain Lookout, located inside the Glacier Peak Wilderness. 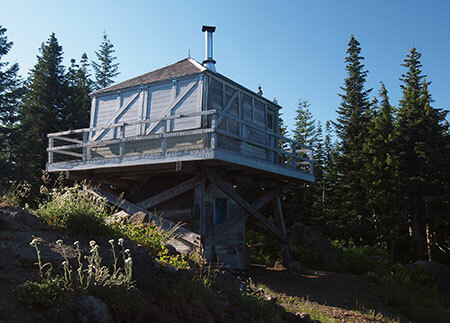 The Forest Service was taken to court in 2010 over a major restoration of the historic lookout needed to save the structure after years of neglect, including the use of helicopters to carry materials to the remote lookout site. In 2012, the case resulted in one of the three court rulings that have since become the mantra against protecting wilderness structures, and the Forest Service began preparing to remove the building under court order. Historic resource advocates in Washington State were stunned, and took the case to their congressional delegation. Under the leadership of Senators Patty Murray and Maria Cantwell, Congress acted to permanently protect the structure in April of this year, paving the way for the Forest Service to continue to maintain the Green Mountain lookout for the enjoyment of the public indefinitely. Saving it by using it? Ramona Falls is among the most visited wilderness destinations in the country and could use a better ranger presence – why not use the Upper Sandy Guard Station as a base? So, how can the Upper Sandy Guard Station be saved? Above all, the building needs an energetic advocate in the form of a non-profit dedicated to historic preservation our public lands – or perhaps even a “Friends of the Upper Sandy Guard Station” non-profit. 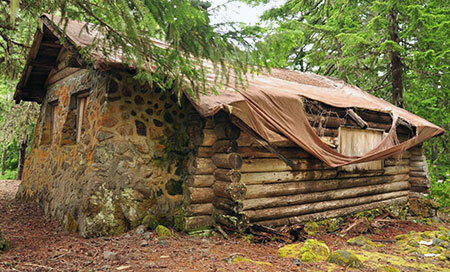 The fact that the Mount Hood National Forest has been so arbitrary in its decisions to maintain or build some wilderness structures while allowing others to fall into disrepair is an opportunity: consistent, persistent pressure should be enough to get the Forest Service to do the right thing, and save this priceless old building. Another possibility is an act of Congress, mirroring the Green Mountain precedent. Given the dire state of the building, perhaps Oregon Senators Ron Wyden and Jeff Merkley could follow in the footsteps of Washington Senator Murray and Cantwell, and simply direct the Forest Service (and the courts) to preserve and restore the building? But even with needed repairs, the Upper Sandy Guard Station still lacks a sustaining purpose beyond its intrinsic value as a historic structure. 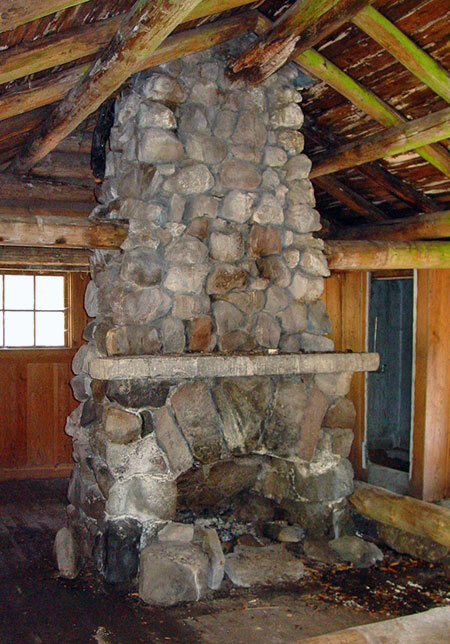 Clearly, the Forest Service sees little value in the building, but to hikers, the structure could be invaluable if managed as a recreation resource. 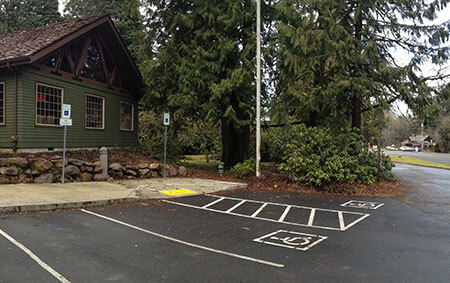 Here’s how: in summer the guard station could operate in its intended function, with volunteer rangers living in the building during the period when the Sandy River trail bridge is installed (late May through September). This would put a needed presence on a trail that is heavily traveled, and unfortunately has problems with car break-ins and rowdy visitors at Ramona Falls. The building has the potential to be quite comfortable, as it was originally served with a piped water supply (since removed), and had a sink, small kitchen and even a shower stall that still survives. Volunteer seasonal rangers could also serve as interpreters, giving tours of the old structure and answering questions at Ramona Falls, where the overwhelming share of visitors are casual hikers and young families new to the forest. Once the seasonal trail bridges have been removed in fall, the guard station could transition to a winter rental, much as several lookouts in the area and the historic guard station at Tilly Jane are operated today. The Old Maid Flat area is a popular snowshoeing and Nordic skiing area, and a restored guard station would be an idyllic overnight destination in high demand. 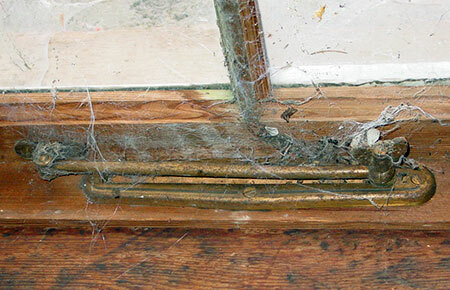 Revenue from rentals could also help pay for needed maintenance and repairs to the structure. This magnificent fireplace stands at the center of the guard station; the room in the background is a built-in shower, lined with galvanized steel. Could this really work? There are some logistical consideration that would have to be bridged by the Forest Service to actually bring the building back into public use, but they are not insurmountable. First, regular use of the structure would require an outhouse to be restored to the site. Hopefully the original location could be determined from old photos or building plans. 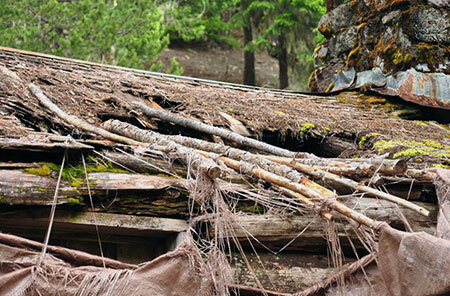 Second, the building would need to be supplied with firewood for winter use, which in turn, would require a woodshed. The National Historic Register evaluation of the building describes a shed that was apparently dismantled many years ago, but could be faithfully restored as part of reconstructing the guard station as it was originally built. Today, the main structural risk to the building is where several holes have formed in the roof around the chimney. The tarps visible in this photo were placed by the National Historic Register survey crew in 2008 to help stabilize the building. 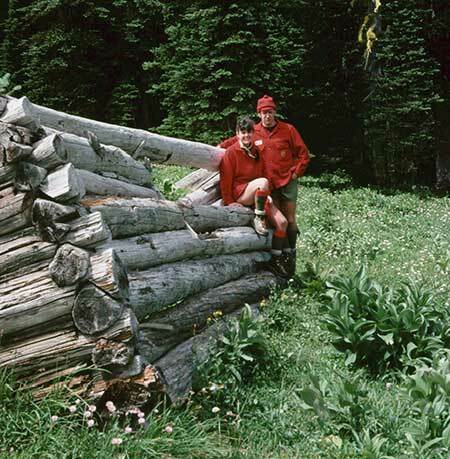 Supplying the Guard Station with firewood would be another matter, as any firewood would need to be collected without the use of power tools — a routine task for the hardy individuals who built these structures, but more daunting to us in the modern era. This could be one of the activities of the summer resident rangers. Bundles firewood could also be dropped at the site when a helicopter is already being used to pull out the Sandy River hiking bridge at the end of the summer season. Hopefully, this beautiful old structure will find a champion soon, as time is running out for the Upper Sandy Guard Station. While the building condition was described as “excellent” as recently as the 1980s, it has begun to experience major problems from neglect. Worse, vandals have since stripped the building of furnishings and even burned the original wood shutters. The Upper Sandy Guard Station deserves better! If you would like to see the building for yourself, it’s easy to find. The building is on a bench above the Sandy River floodplain, just a few hundred feet off the trail where the Ramona Falls loop intersects the Pacific Crest Trail, near Ramona Falls. 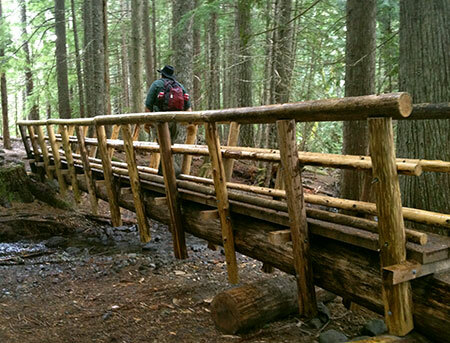 The best time to visit is during the summer, when the Sandy River hikers bridge has been installed for the season. Mount Hood National Forest (MHNF) recently completed a much-needed, $1.7 million overhaul of its dated Zigzag Ranger Station, the de-facto visitor gateway to Mount Hood. 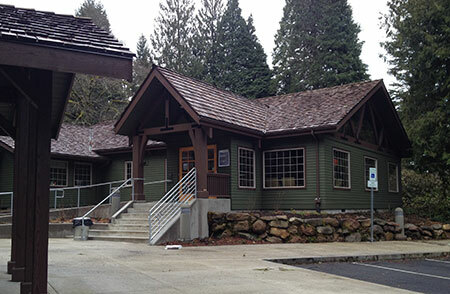 The new ranger station and visitor center not only provide a modern facility for forest visitors, it was also designed to compliment the rare collection of historic forest buildings that sprawl across the Zigzag campus, the entirety of which was listed on the National Historic Register in 1986. It’s a big step forward for Mount Hood. Meanwhile, the Upper Sandy Guard Station, located just a few miles away near popular Ramona Falls, has fallen into serious disrepair, all but abandoned after years of neglect. The Upper Sandy Guard Station is also listed on the National Historic Register (in 2009), yet now is on the brink of collapse. Basic repairs would cost a fraction of what the Zigzag project cost, so why the disparity? This is a two-part story about the two historic ranger stations, one reborn and the other about to die, and how this frustrating chain of events came to pass. And, most importantly, how the Upper Sandy Guard Station might still be saved. Mount Hood has always lacked a truly functional visitor center. For years the 1960s-era Zigzag ranger station, with its cluttered, cramped public counter, served as the main stop for visitors new to the area. The old Mount Hood National Forest headquarters was actually worse, located in a rundown section of east Division Street in Gresham, next to mini-storage. It was hardly an inspiring “gateway” to Mount Hood. A relatively new forest headquarters building was constructed in Sandy in the 1990s with a more aesthetic design the 1990s, but is awkwardly located in a suburban industrial park, where the public is discouraged from visiting the building. Few travelers even realize they are passing the building, though it is within plain view of the Mount Hood highway. 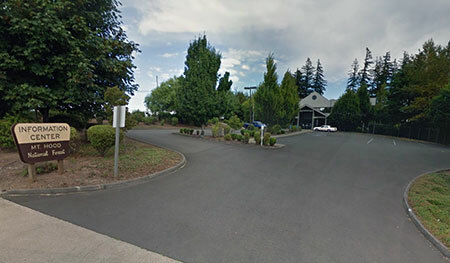 The “new” (1990s) Mount Hood headquarters hides in an industrial park on the outskirts of Sandy. The new headquarters in Sandy was a missed opportunity to build a visitor gateway on a scale that reflects the millions who visit the mountain each year. Most regrettable was the decision to locate the building two miles from downtown Sandy, where it could have been easily found by visitors, but also would have complemented other visitor facilities there, and reinforced the tourism economy that is so important to the town of Sandy. By the late 1990s, the Forest Service had formed a partnership with Clackamas County and the Mount Hood Chamber to open a new visitor facility in a vacant commercial space on the Mount Hood Village RV resort grounds, a few miles west of Zigzag. This odd arrangement operated into the mid-2000s, but was eventually closed due to county budget cuts. Relatively few visitors found their way to this location, anyway, so the closure mostly impacted hikers who had enjoyed the convenience of a public restroom. After the RV resort experiment, the visitor gateway to Mount Hood reverted to an outdoor kiosk at the 1960s-era Zigzag Ranger Station. A portable toilet was added to the parking area to complete the outdoor facilities. This arrangement served as the main visitor experience until last summer, when the handsome new ranger station and visitor center opened. The good news is that the original Civilian Conservation Corps (CCC) era Zigzag Ranger Station also survives, along with nineteen other historic structures on the Zigzag site. To the credit of the MHNF, all of these structures have been well preserved over the decades for their historic significance at a time when historic forest service structure around the nation are rapidly fading away. While the visitor gateway to Mount Hood bounced around over the past several decades, other national forests in the region were moving ahead with bold visitor centers that signaled a new focus on recreation. Notably, the Willamette National Forest built four expansive new ranger stations in the 2000s on far less travelled forest gateways than loop highway approach to Mount Hood, including a dramatic new Detroit Ranger Station (below), which opened in 2009. 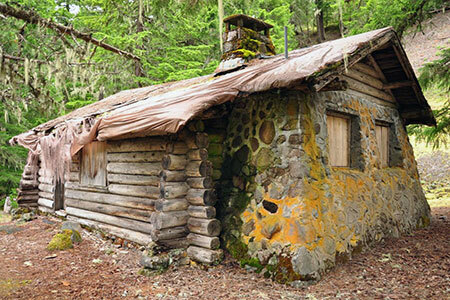 Meanwhile, the Mount Hood National Forest limped along with the fading 1960s era Zigzag Ranger Station and a similarly dated and cramped Estacada Ranger Station. 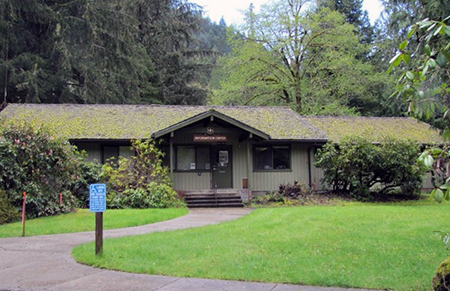 The Hood River Ranger Station is even worse, a leased space until recently, and little more than a portable building. Perhaps a bit of intra-agency envy ensued, as the Mount Hood National Forest finally assembled funding in 2012 for a major upgrade to the Zigzag Ranger Station. Requests for construction bids were titled the “Mount Hood Scenic Byway Portal Project”, a fitting acknowledgement of the main focus of the building upgrade. 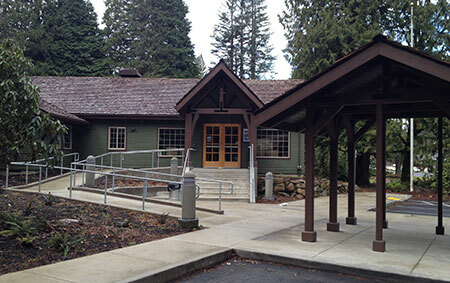 The new Zigzag Ranger Station (below) is tucked into the historic complex at Zigzag, east of the original ranger station and incorporating the 1960s era building. Though not as grandiose as the new gateway structures in nearby Willamette National Forest, the new Zigzag facility has an attractive, rustic design that complements the surrounding historic structures rather than overshadow them. DKA Architecture of Seattle designed the project, which includes a remodel of the old 1960s structure with new additions that double the square footage of the facility. Payne Construction of Portland was selected from a competitive bid to build the new facility. 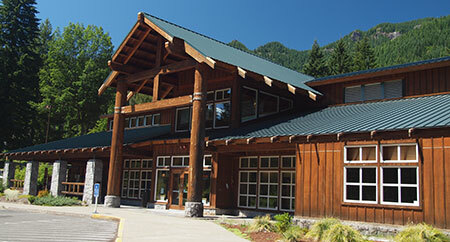 The new ranger station and visitor center has three main elements: (1) the indoor reception and visitors area, backed by administrative offices and conferences rooms, (2) an outdoor plaza and display gazebo and (3) separate public restrooms. The new ranger station structure is clad in clapboard siding and shingled gable roof, echoing the Cascadian architecture of the original 1935 structure. HBB Landscape Architecture of Seattle designed the mostly rustic landscaping around the new structure. Modern touches to the landscape include a concrete, railed wheelchair ramp and sleek lighting bollards. The landscape design appropriately focuses on native plants, including sword fern, salal, Oregon grape, rhododendron and even some stonecrop tucked into a rock retaining wall, all just getting started, but well suited to thrive here. 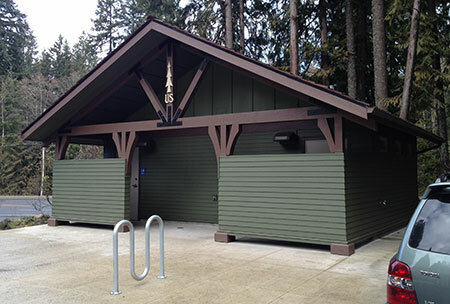 The very modern public restroom is located across the small parking area from the new ranger station and visitor center. The proximity to US 26 and dramatic improvement over the portable toilets (yikes!) that used to be here will make these restrooms a popular stop along the loop highway – and hopefully inspire travelers to take a few minutes and explore the visitor center, as well. The restroom exterior design has a nice touch: the traditional 1930s “open pine tree” logo is incorporated into the center gable post, a thoughtful nod to the collection of historic CCC buildings that surround the new facility. The restroom includes a single bicycle rack — minimal, but easy to expand over time, thanks to the spacious plaza in front of the restroom. The informational kiosk in the plaza is still not complete (assuming there will eventually be information posted here! ), which apparently inspired Zigzag staff to begin tacking fliers to the brand new siding near the front door with thumbtacks. That’s not how most of us would treat freshly painted siding on our homes, so it’s disappointing to see on such a beautiful new facility (not to mention that a nearly identical poster hangs two feet away, in the window on the main door). 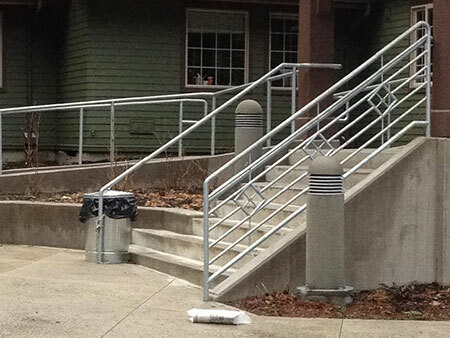 Likewise, the Zigzag District staff has chained a cheap galvanized trashcan to the sleek new entry rails at the main entrance stairway — jarring against the handsome new architecture, and perhaps just a temporary solution. Hopefully, a permanent trash and recycling station is on order for the plaza area! Another gap in an otherwise fine new design for the ranger station is the lack of benches and tables outside the visitor facility. It’s another detail that can easily be addressed, and perhaps was anticipated in the landscape design, as well. 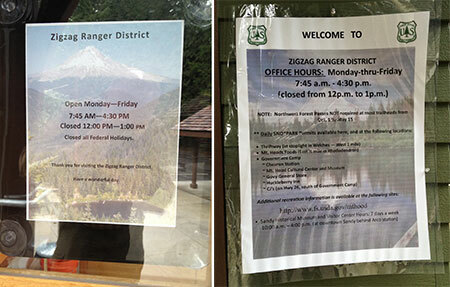 The new ranger station is a pleasant place to be, and visitors will want to spend time here. Overall, the new Zigzag ranger station and visitors center is a very big step forward, and a welcome development for those discovering Mount Hood for the first time. While the $1.7 million price tag may seem steep to some, it’s a very reasonable expense for a facility of this scale — and especially given the context of some 2.6 million visitors pouring into the area each year. Hopefully, similar facilities will eventually be constructed at the Hood River and Clackamas gateways to Mount Hood, as well. But for many, the substantial price tag for the new Zigzag ranger station raises another question: if we can afford to build a brand new station at Zigzag, why can’t we afford to simply stabilize the beautiful Upper Sandy Guard Station, which teeters on the brink of being lost forever?